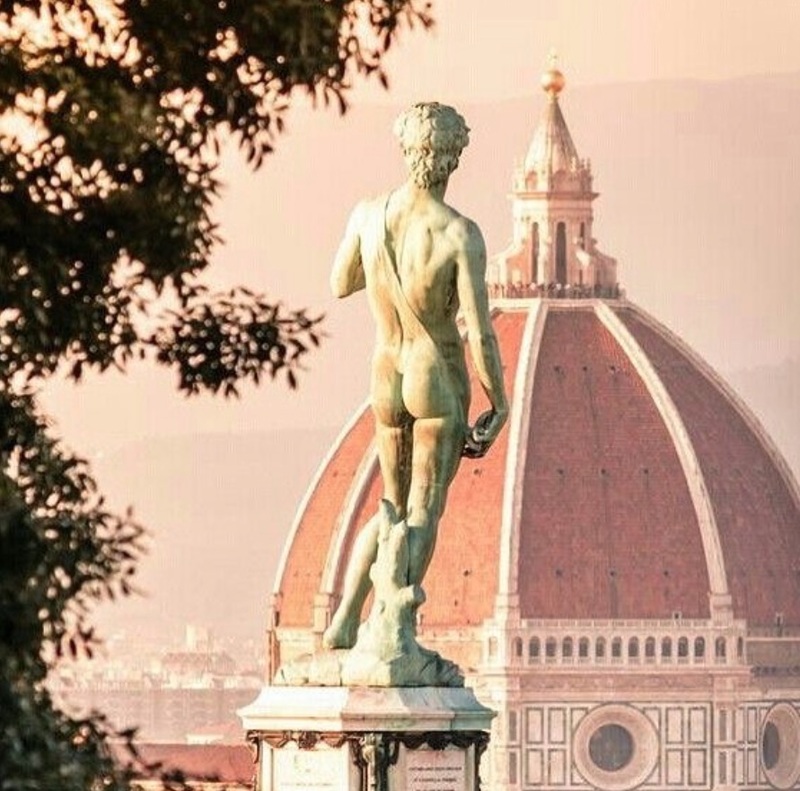 Florence's five best panoramic views, discover best places in Florence! 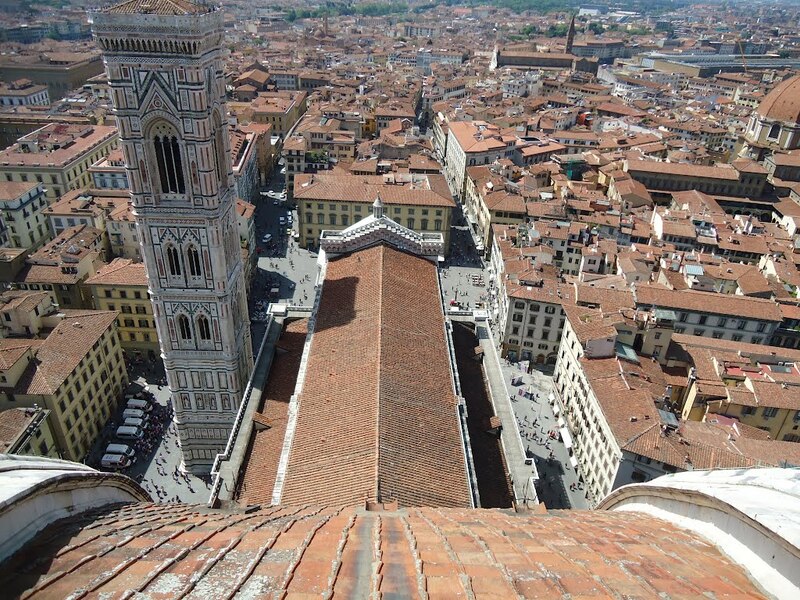 Florence’s five best panoramic views: looking down from on high! Let’s talk again about the beautiful city of Florence! After the best Florence’s Basilicas, now we are looking at Florence’s five best panoramic views. Florence is so chock full of art that there are limitless chances to enjoy it, both inside museums and outdoors. Walking along its major streets, you can delve into Renaissance art on the facades of the palazzi on every corner. First on the list of the five most panoramic views of Florence is Piazzale Michelangelo. This is first and definitely the most famous. You can get there by enjoying a pleasant stroll along the Arno in the direction of the Tower of San Niccolò. A street behind it winds up to the Piazzale, Where there is a large copy of Michelangelo’s David, proudly gazing over the city. Have fun trying to pick out Florence’s famous buildings. Get oriented by the Ponte Vecchio and take a little mental tour of Florence’s center. From here look at the Uffizi, whose big windows on the river are easy to spot. Right next to it you’ll recognize the tower of Palazzo Vecchio. Follow the gentle flow of the Arno as it continues out of sight to the south of Florence. 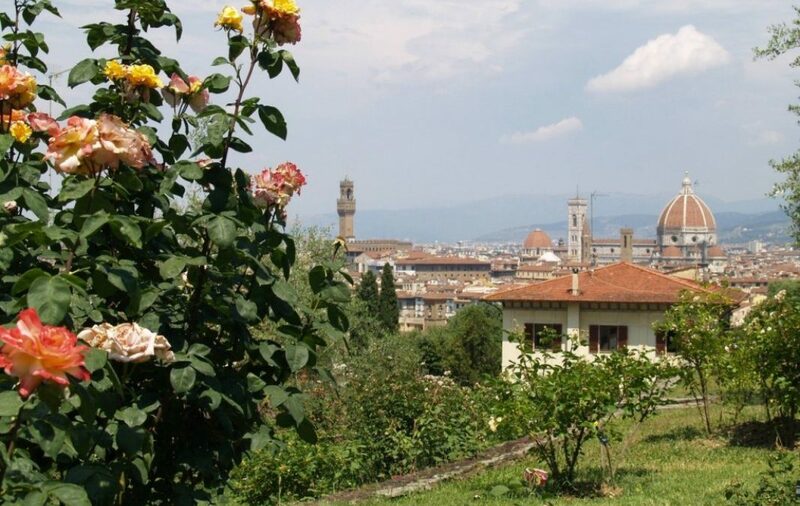 Florence’s five best panoramic views, the Rose Garden! Among Florence’s five best panoramic views, not to forgo is one of most romantic ones: the Rose Garden! After taking a classic picture with Florence in the background, go back to the street that led to the Piazzale. Strolling along at your own pace, you’ll see a small gate to the right before the last curve that brings you back down to the river. It can be easy to miss at first glance: the entrance to the Rose Garden. You’ll be sure to enjoy this delicious, lesser-known garden. This garden space is lovingly tended, and you can admire the roses grown by skilled gardeners and several statues by the fascinating Belgian artist Jean-Michel Folon. Linger in the garden and enjoy Florence’s special sunlight and views. When you’re ready to go, let’s get back to our tour of Florence’s terraces. Forte Belvedere and Florence spreads before you! So let’s jump back into Florence’s streets, but just to get to our next viewpoint: Forte Belvedere is the next stop on our journey. It’s easy to get to this defensive outpost of the Medici’s Florence: just go past Pitti Palace and walk towards the Ponte Vecchio, on the right, next to the Church of Santa Felicita, the street called Costa San Giorgio will take you there. Walk all the way up it to get right to the Forte. Then go into the large garden around the fort, expansive spaces often featuring sculptures by contemporary artists, such as Antony Gormley and Giuseppe Penone. The view from Forte Belvedere is beyond compare; photographers will love it as you can snap pictures of the many sights visible from the terrace’s many vantage points. One such view is the Italian garden in front of the Ceramics Museum inside Boboli Gardens. The “Duomo” offers one of the most breathtaking panoramic views of Florence! The way back is a nice easy downhill stroll to Ponte Vecchio. Back in the heart of Florence, head to its historic symbol: the dome of Santa Maria del Fiore: “Il Duomo.” After you’ve bought your ticket, you can go up to the dome: it is 463 steps up and as you climb your pleasant anticipation will also mount for the spectacular view that awaits you at the top. You’ll get a chance to admire the frescoes on the base of the dome and get to see close up the structure of the matchless, eternal dome, the fruit of Brunelleschi’s genius. You’ll get a full view of the square in front of the Duomo and the Baptistery’s geometric structure. Florence’s five best panoramic views: Fiesole Hill! And you can be proud of having climbed Florence’s highest peaks. There is one more spot to get to full of amazing surprises, but we have to go a few kilometers away out of the city center: The little hill town of Fiesole. You can get there easily on public transportation on frequent buses from Piazza San Marco that will take you straight to Fiesole’s central square. Ten minutes before you get to the village the view already turns panoramic. When you get to the square, turn left with the town hall behind you on the other side of the square. You’ll get to small gardens that overlook Florence. The view from Fiesole is truly special; its height lets the view embraces the entire city all the way to the neighborhoods furthest from the center. When you’re done visiting Fiesole, don’t forget to check out its wonderful amphitheater, a theater with an excellent full summer season of shows. This brings us to the end of our tour of views of Florence. Now you can say you’ve really enjoyed Florence from every perspective!